OMFS are dental specialists who are surgically trained in hospital-based residency programs and work with medical residents in numerous different medical specialties to gain comprehensive knowledge. This knowledge is focused on the mouth, jaw, face, muscles of the face, bone, and skin. In all provinces, candidates for OMFS must first hold a dental degree (DDS) and be able to demonstrate successful completion of the National Dental Examining Board exams. The candidate must then complete an Oral and Maxillofacial Surgery residency program and pass the National Dental Specialty Examination (NDSE) in Oral and Maxillofacial Surgery administered by the Royal College of Dentists of Canada (RCDC). The licensing requirements for individuals to become certified as an Oral and Maxillofacial Surgeon fall under the Provincial Jurisdiction for the province in which the OMFS practices. There are six Canadian Training Centers for candidates to obtain their education as an Oral and Maxillofacial Surgeon: Dalhousie University, McGill University, Université Laval, University of Manitoba, University of Toronto, and Western University. The duration of the program varies between institutions, but generally they are between four and six years of study. 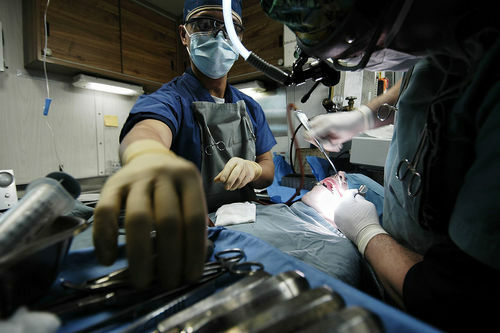 How much do oral surgeons make? The average oral & maxillofacial surgeon salary in Canada is $278,067 or an equivalent hourly rate of $134. In addition, they earn an average bonus of $15,294. Salary estimates based on salary survey data collected directly from employers and anonymous employees in Canada. This is according to www.salaryexpert.com. It is rather unnecessary to have an oral surgeon perform every type of oral surgery. Associate dentists and orthodontists are experts in many common dental problems. A patient would require the skills of an oral surgeon only if there are very complex extractions or a deeper level of sedation is involved in the process. An oral or maxillofacial surgeon is normally recommended by an associate dentist or orthodontist if there is a need for complex alignment of jaw bones, a tumor in the jaw, or some cosmetic reconstruction. Let’s take a look at some of the processes that require such expertise. Wisdom teeth are the last set of teeth to develop and in normal cases, should develop along the gum line where there is enough space for them to flourish. However, in many cases, the wisdom teeth fail to emerge fully through the gum line and instead get entrapped or impacted within the jaw bone. This causes swelling of the gums, injury, irritation and most often, infection. Gross cases of impacted teeth can lead to a formation of tumors in the jaw. Dentists often refer people to oral surgeons to have these “impacted” wisdom teeth removed. Orthognathic surgery is needed if an orthodontist finds it difficult to fix a misaligned bite. This often happens in cases of birth defects resulting in congenital abnormalities. Oral surgeons work closely with orthodontists to reposition the teeth, treat severe orthodontic conditions and other oral disorders. Oral surgeons work in synergy with cosmetic dentists to restore your smile and subsequent placement of implants. Oral surgeons repair the bones in the area where the implants are to be made as well as modify gum tissue to best suit the cosmetic appearance of the implants. Oral and maxillofacial surgeons specialize in treating complex facial alterations, set fractured jaws, fix ruptured jaw bones, and reconnect facial nerve endings. They also treat many other traumatic injuries related to the forehead, eye sockets, nasal cavity and neck region. An oral and maxillofacial surgeon can diagnose and treat pain related to the temporomandibular joint (TMJ). An oral surgeon will request for mirror images and advise on the next step to take by making recommendations to other specialists, or may suggest surgery if non-surgical treatment proves unsuccessful. Sleep apnea is a form of breathing interruption that occurs when a person is asleep. In essence, a person experiences an interruption in regular breathing (an apena) that can last from a few seconds to a few minutes. These frequent interruptions in regular respiration during sleep can result in fatigue during the day, mental fogginess, and issues with attention and memory. Obstructive Sleep Apnea (OSA) – The breathing interruptions are a result of a physical blockage in the airways. This is the most common form of sleep apnea. Central Sleep Apnea (CSA) – The breathing interruptions are a result of a problem in the brain's respiratory control center. Mixed Sleep Apnea – The breathing interruptions are a result of both OSA and CSA factors. Surgery is a potential treatment for OSA if non-surgical treatment options prove ineffective or not a viable option. The ideal kind of oral surgery to address your sleep apnea will depend on the nature of your case and your general health and wellness. If your sleep apnea is mixed, a combination of surgery and other therapies may be ideal. We will be sure to discuss all surgical and non-surgical treatment options for your case of sleep apnea during a consultation at our practice.